It's been cold ... so naturally, I craved something rich, and beefy. Rich and beefy in a wine broth. Last year, I tried Pie Face's chunky steak pie with the most beautiful red wine flavor. It instantly brought me back to winters when I was a child, and the beef stew my mother used to make (though honestly, Pie Face's flavor was better). In a word, the Pie Face steak pie tasted like Christmas. 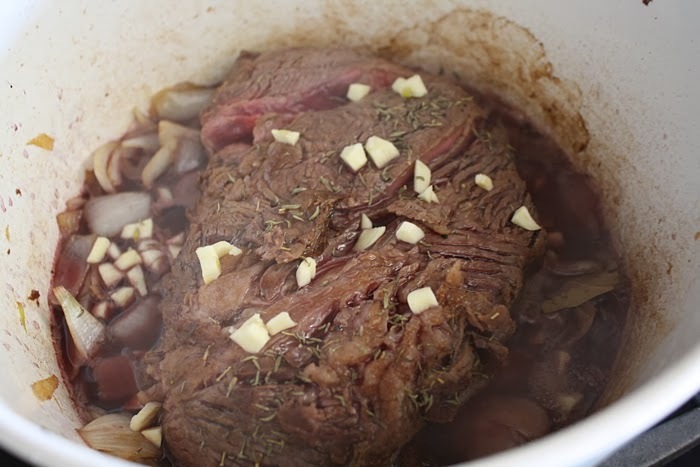 So I looked for a beef recipe with red wine, and I settled on pot roast. I adapted this "classic" pot roast recipe from Cooking Light. It's an easy recipe, but that doesn't mean it's not time-consuming. Most of the cooking time is relatively inactive -- just make sure to check on it every once in a while. Heat olive oil in a large pot over medium-high heat. Season the chuck roast with salt and pepper. Add roast to pan and cook for 5 minutes, or until it's brown on all sides. Remove roast from the pan, and add onion. Sauté for 8 minutes or so until tender. Return browned roast to pan. Add the mushrooms, red wine, thyme or rosemary, chopped garlic, beef broth and bay leaf to pan and bring to a simmer. Turn heat down to low and cover pan. Cook for 4 hours, or until the roast is almost tender. Alternate adding a half cup of water and/or broth to the pan whenever the broth level gets low. You could also add more wine. Add the carrots and potatoes to the pan, cover and cook for an additional hour or until the vegetables are tender. Remove herbs from the pan and discard. Serve roast with vegetables and some of the remaining broth. This turned out incredibly rich and flavorful, though it wouldn't have hurt to have added more wine!